A few weeks ago I was sent St Ives fresh skin invigorating apricot scrub* and sensitive skin gentle apricot scrub* by the lovely Tasha to try out. I was actually very excited to try this scrub as it is a product which I have always seen out on the shelves at Boots and Superdrug but I never picked it up thinking it would be too harsh for my skin. I normally use my Clarisonic Mia three times a week to exfoliate my skin as sometimes it can be too harsh to use on a daily bases. My skin is normal to dry so therefore it is important for me to exfoliate on a regular interval otherwise my foundation base never looks good as I can suffer from dry skin patches from the dead skin cells. "Only St. Ives captures the secrets of naturally beautiful and healthy looking skin in this deep cleansing formula that gently exfoliates, removing dull, dead skin cells to instantly reveal smooth, radiant, healthy looking skin." There are many benefits of these products, such as it uses 100% natural exfoliant as well as it is sulphate, paraben and oil free. The product also has been dermatologist tested and is hypoallergenic. It claims to give glowing fresh skin..so does it live up to its claims? I have been using the St Ives sensitive skin gentle apricot scrub* for 2 weeks now before bed time and after I have removed all of my makeup and I can say it really does live up to its claim! I have never felt my skin feeling softer and smoother after exfoliating. It really does it's job and makes your skin feel squeaky clean! The smell of the product is also very pleasant and as my readers know, I am very sensitive to smell and I always find it difficult to try something out if the smell is not great. I have also used the St Ives fresh skin invigorating apricot scrub* on alternate days however I did find it to be a little harsh (maybe because I was exfoliating way too much?!) hence I started using it as a body scrub instead and I must say I am very impressed. I am sure St Ives do a body scrub version of this but in a tub instead which I have seen in my local beauty stores. I wear fake tan to even out my skin tone and it is important to make sure I exfoliate my body to keep on top of things and to make sure my skin is looking as natural and even tone as possible. This product really helped me to get rid of those dead skin cells which I didn't even think existed!! I will be using this again as a facial exfoliator when I know I need a good deep clean! 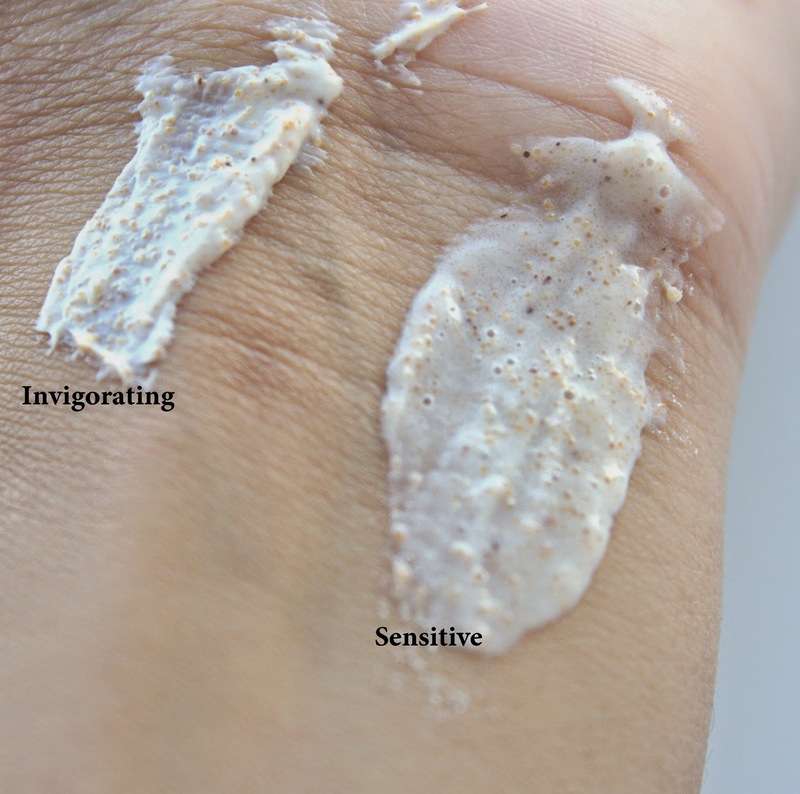 As you can see from the pictures above, there is a texture difference between the two products. 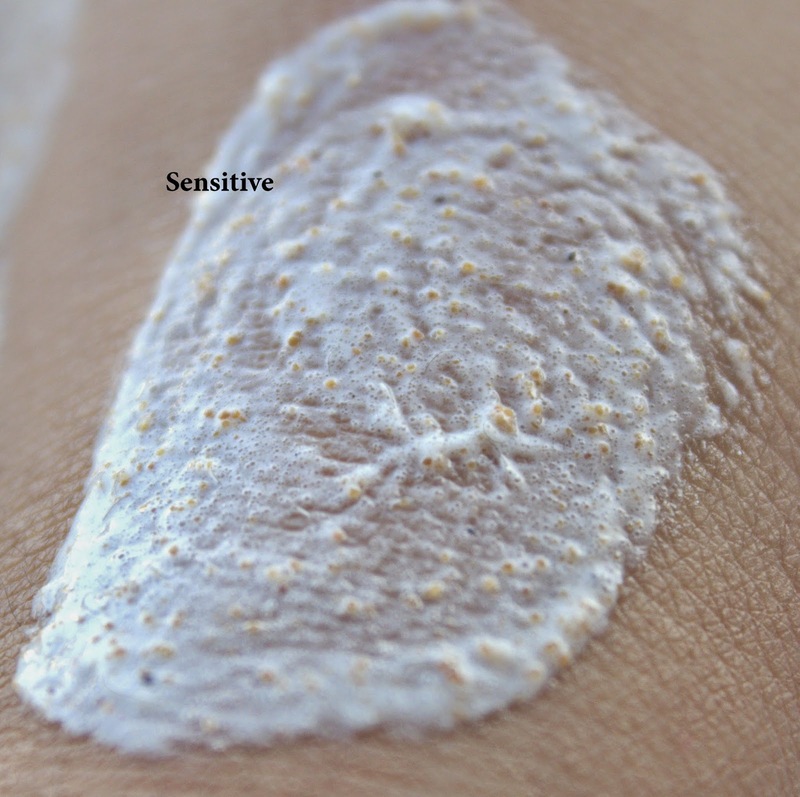 The sensitive one has less beads and is more runny and moisturising compared to the invigorating version which has a dry rough texture and also contains more harsh beads. I would also like to admit, the last a few days I have been going out with bare minimal makeup and I definitely think the credit goes to St Ives sensitive apricot scrub as this the only change I have made. I normally wear a full face of makeup or use a BB cream over summer with some concealer. However over the last a few days my skin has never felt so radiant and glowly hence I have managed to go outside with a bare base on my face. Of course I wore some mascara and eye liner as drawing a black line always makes me feel 10x better! Are any of you like this as well? You always have to wear eye liner no matter what? Anyways back to the review...the beads that are in the scrub are pretty rough in the invigorating scrub so if you have sensitive skin make sure to be gentle or use it twice a week instead of every other day like me. You know how I said the Clarisonic Mia was a bit too harsh for me to use every day and I could only use it three times a week? well the sensitive apricot scrub was perfect and I used it every other day for the second week without it causing any sensitiveness to my skin. I still am using it every other day as I really like the results which I am getting. I also liked how the beads dig deep down causing it to remove dead skin cells effectively but gently at the same time. Would I recommend this? Without a doubt yes I would! If you are looking for a scrub whether to use it daily or a few times a week I would say give this a try. I was actually looking for some cons of this product and in all honesty I can't think of anything major which normally does not happen! The only thing I would say is that I did find it drying out my skin a little...even though my skin felt fresh, clean and soft after I used it there was that dryness feeling as well. However I moisturise my skin before bed so it was not a big problem for me. Don't forget to leave me a comment and to let me know if you have used this product before and what your thoughts are! I'll have to try out the sensitive scrub as I have very sensitive skin, I've been looking for a exfoliating scrub that isn't too harsh.